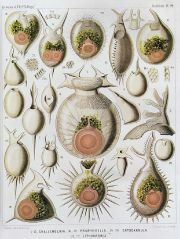 Plate from Ernst Haeckel's 1904 Kunstformen der Natur (Artforms of Nature), showing radiolarians belonging to the superfamily Stephoidea. Radiolaria is a diverse grouping of amoeboid protozoa that produce intricate mineral skeletons, typically with a central capsule of cytoplasm separating the cell into inner and outer cytoplasmic portions, called endoplasm (with nuclei) and ectoplasm (or extracapsulum). As protozoans, radiolarians are tiny, single-celled eukaryotes, and as ameboids they move or feed by temporary projections called pseudopods (false feet). Since there are diverse taxonomic schemes used for protozoans, which span several phyla, the radiolarians are diversely classified as well, ranging from being considered a phylum, to being a subclass of Actinopodea, to not being recognized as a natural taxonomic group. Radiolarians are found as zooplankton throughout the ocean. Because they are found as far back as the early Paleozoic (500 million years ago), are highly diverse, and there is a rapid turn-over of species, their siliceous skeletons (tests) are important diagnostic fossils and help in understanding the history of life. Beyond their practical value to humans, the complex skeletons of the microscopic radiolarians are often very beautiful and symmetrical and add to the wonder of nature for people. Some common radiolarian fossils include Actinomma, Heliosphaera, and Hexadoridium. Radiolarians are amoeboid protozoa. Protozoa is a diverse group of single-celled, microscopic, or near-microscopic, eukaryotes (organisms whose cells have nuclei) that commonly show characteristics usually associated with animals, most notably mobility and heterotrophy. Protozoa span several phyla, which are generally placed as part of the kingdom Protista, rather than the kingdom Animalia. Protista (or Protoctista) comprises those eukaryotes that are not animals, plants, or fungi, and is not a natural (monophyletic group), but rather the "left-overs" from other eukaryotic kingdoms. One of the taxonomic subgroups of protozoa that is commonly recognized is Sarcodina, which are those protozoans that move by cytoplasmic projection or pseudopods (false feet). That is, the amoeboid protozoa are traditionally grouped as the Sarcodina. Amoeboid means those cells that project their cytoplasm, resembling limbs, to move around and engulf food particles. Sarcodina is ranked anywhere from a phylum, to a subphylum, to a class. Radiolarians are placed within the Actinopodea group within Sarcodina, with actinopods being those where the pseudopods are supported by regular arrays of microtubles. However, some newer taxonomic schemes do not recognize Sarcodina as a classification, because it is based on form rather than ancestral connectedness (phylogeny). Some do recognize two major groups of amoeboid protozoa, with the radiolarians included within the supergroup Rhizaria. Radiolarians have many needle-like pseudopodia supported by bundles of microtubules, called axopods, which aid in flotation. A characteristic feature of radiolarians is a membraneous capsule that separates the outer, frothy later of cytoplasm (ectoplasm or extracapusulum) from the central mass of cytoplasm (endoplasm) within the capsule. The nuclei and most other organelles are in the endoplasm, while the ectoplasm is filled with frothy vacuoles and lipid droplets, keeping them buoyant. The axopods are found in the ectoplasm and here digestion typically occurs. Often the ectoplasm also contains symbiotic algae, especially zooxanthellae, which provide most of the cell's energy. Some of this organization is found among the heliozoa. Heliozoans are roughly spherical amoeboids with many stiff, microtubule-supported projections, called axopods, radiating outward from the cell surface. These give them the characteristic sun-like appearance for which they are named, and are variously used for capturing food, sensation, movement, and attachment. They are similar to radiolaria, but they are distinguished from them by their lack of central capsules and other complex skeletal elements, as they only produce simple scales and spines. Radiolarians almost exclusively have been found in ocean environments and as part of the plankton. The two main groups of radiolarians, generally recognized as classes, are the Polycystinea and Phaeodarea. The main class of radiolarians are the Polycystinea. They include the vast majority of the fossil radiolaria, as their skeletons are abundant in marine sediments, making them one of the most common groups of microfossils. These skeletons are composed of opaline silica. In some, it takes the form of relatively simple spicules, but in others it forms more elaborate lattices, such as concentric spheres with radial spines or sequences of conical chambers. They also include the Acantharea, which produce skeletons of strontium sulfate. Despite some initial suggestions to the contrary, genetic studies place these two groups close together. They also include the peculiar genus Sticholonche, which lacks an internal skeleton and so is usually considered a heliozoan. Traditionally the radiolarians have also included the Phaeodarea. However, in molecular trees they do not appear to be close relatives of the other groups, and are instead placed among the Cercozoa. They are distinguished by the structure of their central capsule and by the presence of a phaeodium, an aggregate of waste particles within the cell. Phaeodarea produce hollow skeletons composed of amorphous silica and organic material, which rarely fossilize. The endoplasm is divided by a cape with three openings, of which one gives rise to feeding pseudopods, and the others let through bundles of microtubules that support the axopods. Unlike true radiolarians, there are no cross-bridges between them. They also lack symbiotic algae, generally living below the photic zone, and do not produce any strontium sulphate. The radiolarians and Cercozoa are included within a supergroup called the Rhizaria. 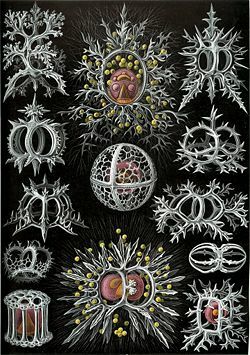 German biologist Ernst Haeckel produced exquisite (and perhaps somewhat exaggerated) drawings of radiolaria, helping to popularize these protists among Victorian parlor microscopists alongside foraminifera and diatoms. Adl, S. M., A. G. B. Simpson, M. A. Farmer, R. A. Andersen, et al. 2005. The new higher level classification of eukaryotes with emphasis on the taxonomy of protists. Journal of Eukaryotic Microbiology 52(5): 399-451. Haeckel, E. 2005. 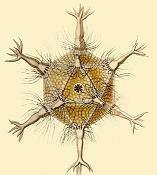 Art Forms from the Ocean: The Radiolarian Atlas of 1862. Munich: Prestel Verlag. ISBN 3791333275. Lopez-Garcia, P. et al. 2002. Toward the monophyly of Haeckel's radiolaria: 18S rRNA environmental data support the sisterhood of Polycystinea and Acantharea. Molecular Biology and Evolution 19(1): 118-121. Zettler, L. A. 1997. Phylogenetic relationships between the Acantharea and the Polycystinea: A molecular perspective on Haeckel's Radiolaria. Proceedings of the National Academy of Sciences 94: 11411-11416. Geometry and Pattern in Nature 3: The holes in radiolarian and diatom tests. Ernst Haeckel: Die Radiolarien (RHIZOPODA RADIARIA) Berlin, 1862. This page was last modified on 23 June 2015, at 15:56.